The federal government on Saturday barreled toward its first shutdown in 17 years after House Republicans, choosing a hard line, demanded a one-year delay of President Obama’s health care law and the repeal of a tax to pay for the law before approving any funds to keep the government running. In all the talk about defunding or delaying Obamacare, there’s one thing that hasn’t been discussed much, certainly not by the Village. That would be what delaying Obamacare would actually mean in the real world. There, we’re looking at dead Americans, needlessly and avoidably cut down before their time. The primary goal of the health care reform is to cover as many Americans who lack insurance as possible. As of this year, that is in the neighborhood of 48 million people — roughly 15% of the total US population. Under the terms of the ACA, that number will be cut by 14 million next year, with more to come as the law persists. That’s still well short of the goal for a civilized society, in my view, but 14 million people with access to health care is a real and important social and ethical good (not to mention an economic plus, in many analyses). Those 14 million people — 14 million individual human beings with hopes and aspirations and real desires to avoid pain, misery and worse — are the primary victims of the morally bankrupt cabal that calls itself the House Republican caucus. If they were to get their way and either fund the government or commit to allow the Treasury to continue to meet obligations already undertaken only on condition that those 14 million must once again go without health care coverage then the suffering that follows is on their heads. In that context, it’s important to note that this means that the House GOP caucus will thus almost certainly be guilty of causing some significant number of unecessary, premature deaths. The study of the connection between mortality and health insurance status is somewhat complicated, and a couple of very well publicized studies recently [PDF] have suggested that there isn’t any correlation and/or that Medicaid coverage in particular makes things worse. Those studies and even more, the trumpeting by such deep thinkers as our old friend, Megan McArdle, have in their turn been strongly criticized, to put it mildly, and they are outliers against a background of some decades of work that show real and deadly links between whether or not you are covered and whether or not you die. analysis of survey data from patients who were uninsured but then became old enough to be enrolled in Medicare suggests that “acquisition of Medicare coverage was associated with improved trends in self-reported health for previously uninsured adults, particularly those with cardiovascular disease or diabetes.” In summary, there is a large and robust body of evidence suggesting that people do, in fact, die because of lack of health insurance. In other words, it’s hard given our current state of knowledge to point to John Doe over there, and say that lack of coverage killed him. The Republican House doesn’t have to worry about answering a bill of indictment charging them in Mr. Doe’s murder. But next year, were the House Republican branch of the Bolshevik party to succeed in delaying (or killing) health care reform, the some significant number of uninsured Does and Roes will die. My truly primitive back of envelope calculation yields an estimate of the number to be sacrificed to meet Republican Congressional priorities in the single digit thousands. Let’s just say the death toll would be on the scale of a couple of 9-11s. The men who flew planes into the towers were terrorists. What, then, should we call the House Republican Caucus, and their Ted Cruz-led Senate colleagues? One more thing: Factio Grandaeva Delenda Est. 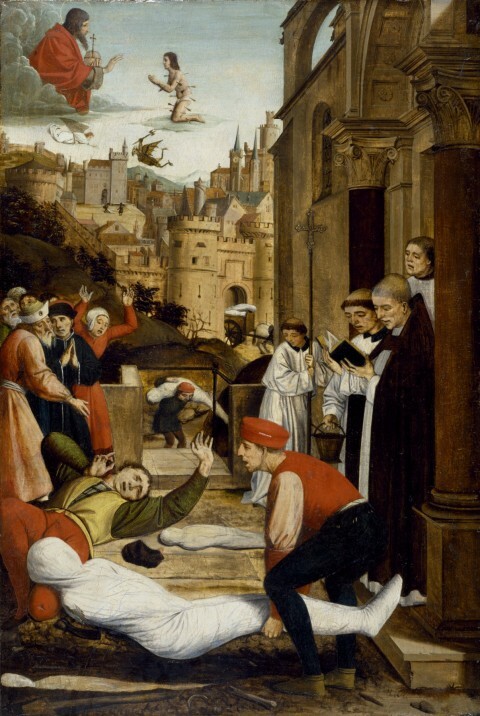 Image: Josse Liefernixe, St. Sebastian interceding for the plague-stricken, 1497-1499. Explore posts in the same categories: Health Care, Massive Fail, Republican knavery, Why Do They Hate America So? This entry was posted on September 28, 2013 at 6:31 pm and is filed under Health Care, Massive Fail, Republican knavery, Why Do They Hate America So?. You can subscribe via RSS 2.0 feed to this post's comments. The Republicans have gone off the deep-end. And Americans will suffer.. the Republicans don’t give a damn about America.. just look at how “well” the average citizen is in strong Republican states.. http://en.wikipedia.org/wiki/List_of_U.S._states_by_income 15 of the poorest 17 states are traditional Republican states. its a house of cards, the Republicans have been getting away with the illusion for years; but they don’t give a damn about America. Reblogged this on Obamacare – Leveraging Your Cheese.